A: BELOW IS A RAW FOOTAGE SMAPLE OF THE 2ND HALF OF NEWTON’S MAGIC OF LEARNING SHOW from Berry Elementary on Monday 4/2/18. 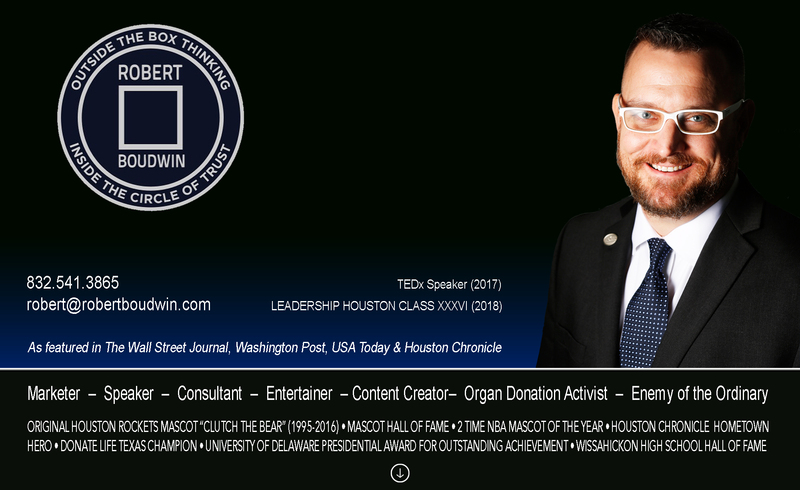 The 2nd half of the show is a motivational speech delivered to the students by Robert (Newton) about his journey as HOUSTON ROCKETS MASCOT CLUTCH THE BEAR for 21 years (1995-2016) about dreaming BIG & working HARD now to achieve those dreams. The magic tricks from the first half of the show are revealed as to how they are done the 2nd half of the show. This all happens under the pretense that they are just TRICKS, but that REAL LIFE MAGIC EXISTS when you take all your education and add your curiosity & imagination to create something new that didn’t exist before like innovator, inventors and creative people do daily and THEY CAN TO! The talk all culminates in the message that the path begins with doing the best they can on the STAAR Test now and practical tips in the short run to maximize their performance. PLEASE CALL MY CELL AT 832-541-3865 for me to explain further. I AM TRULY PASSIONATE ABOUT THIS SHOW & THE VALUE IT HAS TO OFFER YOUR STUDENTS & SCHOOL AS A WHOLE! Q: DOES THIS SHOW STILL EXCITE & CAPTIVATE KIDS AS MUCH AS THE CLUTCH SHOW DID BEING ASSOCIATED DIRECTLY WITH THE ROCKETS BRAND?